haha, that JLA Team Red is awesome. Will you do a Team Blue and a Team Green, too? RiZ thanks! I had planned to do Green, Blue and White teams but I've put it off indefinitely to do other work. Would be Fun. 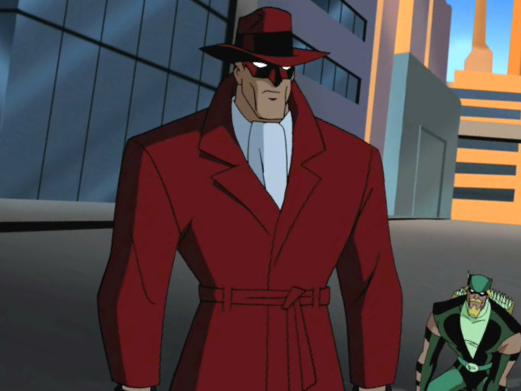 You know on the Animated JLA there's a character that looks like a the Question but with red coat and hat with red eye mask. Who is that guy? GMan thanks, Crimson Avenger huh? wow I've never heard of him. I could name or at least remember seeing nearly every person hanging out in the JL tower but that guy. Awesome job!! The colouring and lines, beautiful. That drawing was strait to inks, made a few mistakes but just keep moving then hid a bit with the colors and texture. AWESOME! Very moody, very flowing! Great use of red black and grey, goes nicely together! Great picture. I could easily see this as a cover for an Elektra mini-series. Well done!!! here's another elektra from my 1st sketchbook drawing.. Awesome!! And I love the background scribbles, adds a lot.